Another update for anyone watching the page – 2/10/2012. There appears to be some timing issues with the LCD library I wrote – which have become apparent since I made teh delayMicroseconds() function more accurate. More updates on the page linked to below as well as some nre Fristing diagrams! Update to this page – 11/7/2012: Decided to make a “proper” LCD library and add it into the wiringPi library. See here for full details. Doing a bit of a tidy up, I found an old, but unused 16 x 2-line LCD text display module. Type: LMB162A. This has a fairly standard controller on it which accepts simple commands and ASCII text. Problem No. 2: The LCD controller is a read/write device, and if it were to ever try to write to the Pi, it would put 5v on the output pins… But who wants to read from it anyway, so I hard-wired the R/W pin to ground, so it was permanently in write mode – which also meant I needed one less wire from the Pi to the module. So 8 data bits, a bit to tell it you’re writing a command or data, and a strobe bit. 10 GPIO pins needed. I used the first 8 general purpose IO pins and the 2 I2C pins set to output mode. The LCD was powered from the 5V on the GPIO connector. And after some simple software, it worked! Your projects are absolutely great!!! Your tutorials are great for beginners and experienced users as well! Could you please send me your code to control the LCD module? I’ve put a link to the code so-far in the article, so just re-load it and you’ll see the link. The program I wrote is very basic, but it contains the essence of what you need to put text on the display. Since I’ve had a couple of enquiries about it now, I might just make the effort to expanding it and making it a bit easier to use. Contrast adjustment (VO) — ? Clock (Enable). Falling edge triggered — 9 ? Backlight Anode (+) — 3.3V ? Do you think these are correct? VCC on the LCD module I’m using goes to +5V. If you have a 3.3v module then it’s obviously going to go to the +3.3v pin. The contrast pin – I have that going to the wiper of a 10K pot between +5V and 0v. RS – GPIO pin 0 (SDA0) – or wiringPi pin 8. E (clock/strobe) – GPIO pin 1 (SCL0) – or wiringPi pin 9. I’m using all 8 data lines here. If you want to use 4, then you’ll need to change the code to put it into 4-bit mode and split the dats into 4-bit chunks. Is it surely compatible with the above setup and code? It certianly looks similar from a quick look at the data sheet. It’s also a 5V device, so remember to connect it to the 5V supply of the GPIO header. Most of these LCD devices use the same controller chip anyaway – just double check the pin configurations. Thanks for your quick replies! – if I2C communication works, an ADC (and RTC) could be added as well; so one could measure signals (e. g. temperature, light intensity) and display it realtime on LCD. This would be really-really useful, because the SoC lacks an ADC (and RTC as well). – it would be great if the displayed text could be modified directly from shell possibly without superuser permissions (like the LEDs through command gpio), so scripts could write messages to the LCD. Yes – you’re right – I could use other chip, or I could use serial access displays, or I2C/SPI, etc. all of those things are possible! However… What I’m doing here is just experimenting. Seeing what I can do and what can be done – hopefully giving some additional inspiration to others too! I had an old and unused spare 5V 2-line LCD display, so I wanted to see if I could hook it to the Pi and use it – and I can! And I think that’s the great thing about the Pi – it’s opened up so many possibilities! Sure, I’ve done all this on Arduinos and other microcontrollers on the past too (for fun and for business), but here is a little platform that you can do the development directly on, which I think it really neat. As for the command-like non-root stuff – you’ve seen the wiringPi gpio command, and to adapt the code here to work as non-root wouldn’t be hard at all. (make it set-uid is the obvious one!) Getting comsole messages out – a little bit harder, but writing a fake “serial” driver to integrate into the kernel isn’t that hard, but 2 lines of 16 characters for console messages – challenging! I’m looking at the I2C and SPI drivers in the newer kernels now, so maybe soon I’ll have something going via that interface too. What do you call the cables that connect the raspberry pi GPIO pins to the breadboard? Just wondering if you know where I can get one of these LCD screens. I’ve been hunting about on Google but I don’t want to order 500 of them. Great work here BTW, very much what I am after as a novice playing with my Pi. But do note that’s a 5V display – and make sure you tie the R/W pin to ground to make sure it never tries to write back to the Pi! These screens are available on eBay very cheaply. I got a 3.3V 1602 display from a Hong Kong seller for £3.16 including P&P. Now off to the loft to dig out the Veroboard I bought in 1979. Thanks Gordon for posting this, I’m a bit of a dunce on electronics, maybe I can make it work from your information. Hope so! Let me know how you get on. Dug out a box of bits and my soldering iron, put it all together using a ribbon cable cannibalised from a floppy cable. I’m fairly confident that the wiring’s correct because I’ve tested each GPIO connection with an LED and the gpio utility at the point where it’s connected to the display. I have backlight but no text. Wondering how to start debugging this. that’s a 4-line display but the interface is the same. Pin 1 is 0v, pin 2 is +5v (+3.3 in your case), and pin 3 is the voltage for the contrast. 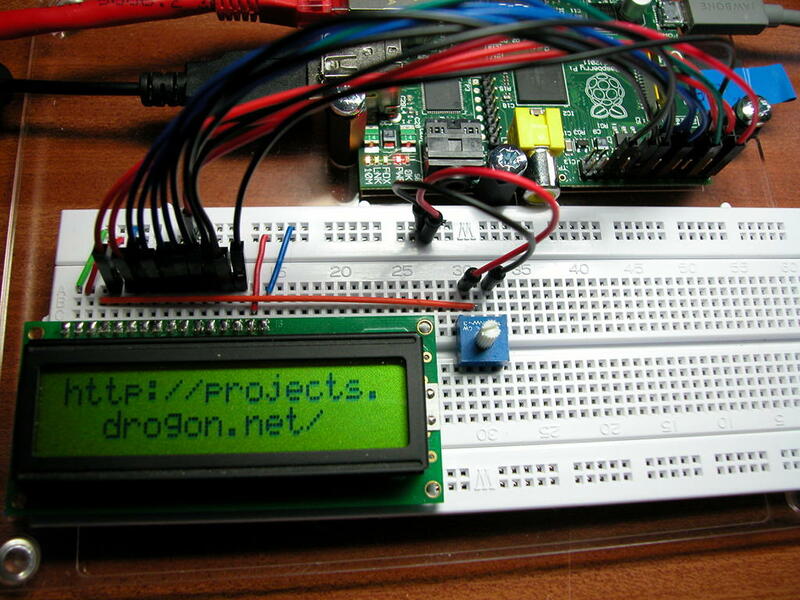 In this photo: https://projects.drogon.net/wp-content/uploads/2012/07/pilcd.jpg you can see that pin 1 goes via a green wire to the 0v line on the breadboard, and pin 1 goes via a red wire. The wires back to the Pi ar harder to make out though. I do wonder if that pin-out on the eBay site is actually wrong! Scrap that above comment. That 10K pot, well I twiddled it and suddenly all became clear. Great work on the GPIO intros! Loving it! Regarding the danger of writing 5v back to the PI – will simply putting diodes between the GPIO and the LCD guard against that? Or will the voltage drop across the diodes reduce the 3.3V below a valid high logic level? Just got my LCD from SKPang and am looking forward to playing with it! I have just connected up my LCD display to the power (Vcc 5v) and added the contrast control (10k pot). I have soldered a hard link between pins 5 and 2 to pull the R/W pin permanently down to zero. I have not connected the Pi yet. However, I am a bit worried as when I checked the voltages on the DB0 to DB7 pins, they are all +5v, even thought the R/W pin is grounded. Is that right? If I connect those pins to the PI GPIO, won’t it fry it?! I’ve double checked the schematic and can’t see anything wrong with how I have wired it. I am really anxious to try out the new display – but dont want to zap my Pi with 5V!!! Make sure the contrast pot does change things – I found that I had to turn it almost fully to one end then the pixels would start to get visibly dark on the display, then hook it up. And do check your power connections – pin 2 is +5v, pin 1 is 0v/ground. Thanks Gordon – I noticed something a little odd though before I gave up last night. If I remove the hard link between the R/W pin and ground all the DBx pins go to ground! It’s almost as if it is the reverse of what the documentation suggests! Maybe though – like you say – they are just floating. I have some 3.3 to 5v converters on order from SKPang, so I think I will wait until they arrive just to make sure I am not doing anything stupid! P.S. it wasn’t me on IRC, unless I am IRC’ing in my sleep….! Pin 1 is 0v, pin 2 is +5v and pin 3 is the input for the contrast. (wiper of a 10K pot between 5v and ground). I am pretty sure that the power is the right way round – if I turn the contrast fully up then the display pixels show black and I assume it would not work at all if it had reverse voltage…. Maybe it is jsut floating like you said. Anyhow – I will double double check the pins tonight and stick some logic converters in just to be sure! OK. Let me know how you get on! Regarding the duff manual, look at the eBay description for the one I bought. The table shows Vdd on pin 1 and Vss on pin 2, and this certainly doesn’t match up with what is marked on the PCB. There are some Nokia LCDs that can be used, but they have a somewhat different interface – it’s a high speed serial type interface rather than video or the parallel interface these character LCDs use. I’ve not used thee type of displays though. I’ll have a look about. I did see some someone had a Nokia 3300 display hooked up, so it’s possible, if somwewhat tiny! I have an LCD up and running, so thanks for this article. Just one question: In the setup() function, in lcd.c, I noticed there are three calls to pinMode that come immediately after the call to digitalWrite. Is this intended, or should the pinMode calls come before the digitalWrite calls, which would seem more logical? The idea is that when the pins switch from input mode (which they are in a reboot time) to output, I’ve already set the output values, so no potential glitches in-case the outputs have been (accidentally?) set the wrong way. Does anyone have any suggestions on what else to try? Well, apparently, lcdClear(fd), was causing the display to clear… but my “Hello!” never showed up! I removed the lcdClear() and it works. I’m going to be looking at this code again in the next few days (if I have time). There have been 1 or 2 issues reported – I think mostly to do with timings. It seems some displays are slower than others… You might want to look at the library and increase the delays in some places to see if it works. i have a QUESTION about the progressbar command on the lcd 2×16 it is normal grows with blocks counting up, is it possible to let it go with thin lines and no blocks, a finer counting progress. Not sure what the progressbar is – I’m guessing its someone elses program, however you can download your own characters to the display – you need to read the manual for the detaisl though. Can the library address the lcd’s in 4bit mode yet? As ive seen quad level changers quite cheep and the lower pi. Count is tempting. It answers all your questions.